"Just a recipe I threw together while entertaining my 6-month-old on a soccer night for my older kiddos when we had limited time. This is an alternative to fast food on busy hectic nights. I prechopped my veggies during nap time, so all I had to do was add them to the Instant Pot®! Garnish with green onions, Cheddar cheese, and bacon." Turn on a multi-cooker (such as Instant Pot(R)) and select the Saute function. Add olive oil, onion, and garlic; cook until browned, about 3 minutes. Add cauliflower, green bell pepper, onion powder, salt, and pepper. Pour in chicken stock; close and lock the lid. Select Soup function; set timer for 15 minutes. Allow 10 to 15 minutes for pressure to build. Release pressure carefully using the quick-release method according to manufacturer's instructions, about 5 minutes. Unlock and remove lid. Add Cheddar cheese, half-and-half, turkey bacon, Dijon mustard, and hot sauce. Reselect Saute function; cook until bubbly, about 5 minutes. This simple veggie soup tastes rich and creamy, but it's completely dairy-free. If using bacon instead of cooked turkey bacon, saute with the onion in step 1. 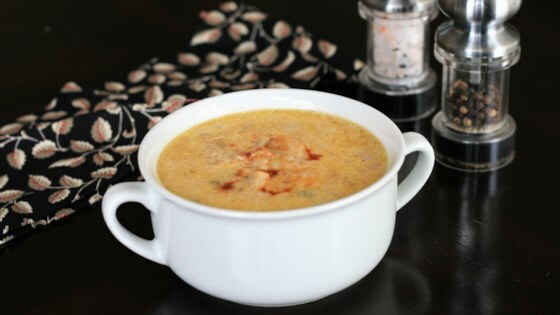 You can use gluten-free flour or cornstarch for a thicker soup (about 1 tablespoon dissolved in a small amount of water or 1/4 cup cold chicken stock), but this would not be keto friendly. The Dijon mustard gave it a weird taste, too twangy also the cauliflower was a little lumpy may need to puree it for better texture. I made mine on the stove instead of using the Instapot. Cooked on the stovetop..blended with a hand mixer before adding the half & half cream, also I used Tex Mex shredded cheese which gave it a nice kick !